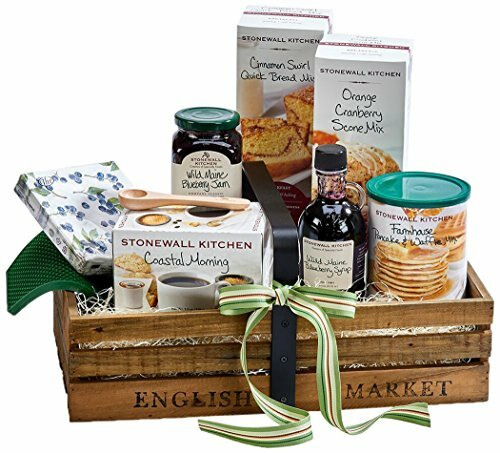 A charming gift reminiscent of a wholesome breakfast in a lovely countryside inn this gift will gather family and friends to the table again and again. Filled with Stonewall Kitchen breakfast ingredients including pancake and waffle mix, wild blueberry jam and syrup, orange cranberry scone mix, cinnamon swirl bread mix, decorative napkins, a handy HotSpot potholder trivet and coastal morning coffee k-cups. A lovely gift to say thank you, welcome to your new home, condolences, thinking of you or for any occasion it is suitable for all tastes. This large wood market basket with black metal handle serves as a pretty centerpiece filled with seasonal flowers or evergreens, a decorative container, on the hearth for kindling or to gather from the garden. If you have any questions about this product by Hebert, contact us by completing and submitting the form below. If you are looking for a specif part number, please include it with your message.